There will be a special guest at this years Sapporo Snow Festival, in Hokkaido, which will be a life size statue of vocaloid singer Hatsune Miku. The statue will be on display at the festival between the 6th to the 12th February. Hatsune Miku will also have a line of Snow Miku goods produced that will only be available at the festival. These will be co-created with the Hello Kitty company Sanrio. This will include two plush dolls and a limited run of 3,000 Nendoroid Snow Miku Fluffy Coat Ver. figures. Another collaboration with this event is a special railway service called Yuki Miku Densha (which translates as 'Snow Miku Train') which will be running between 19th December and 30th March. 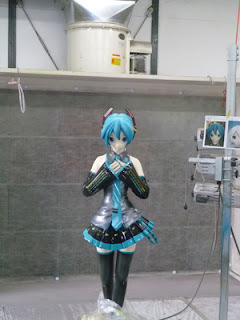 This is completed by Hokkaido Prefecture Sapporo City, who also redesigned the trains last year with Hatsune Miku.